Bridal White Lace and Flower Hairpiece. Sparkles, Flowers and Lace ,everything a Bride wants ! This Designer Wedding Hair Comb made by An Eye For Style, is layered for a spectacular 3-dimensional hair comb that will adorn any bridal gown with glistening elegance. 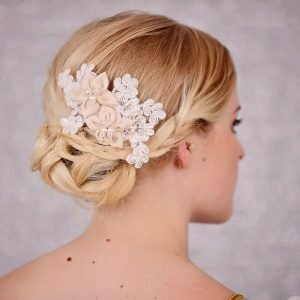 This gorgeous hair comb is a unique statement piece with Hand Beaded Lace ,Silk and Lace Flowers and Sparkling Rhinestones. 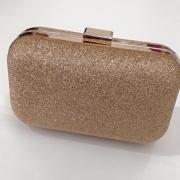 18 cm long x 10cm wide (at widest point ). 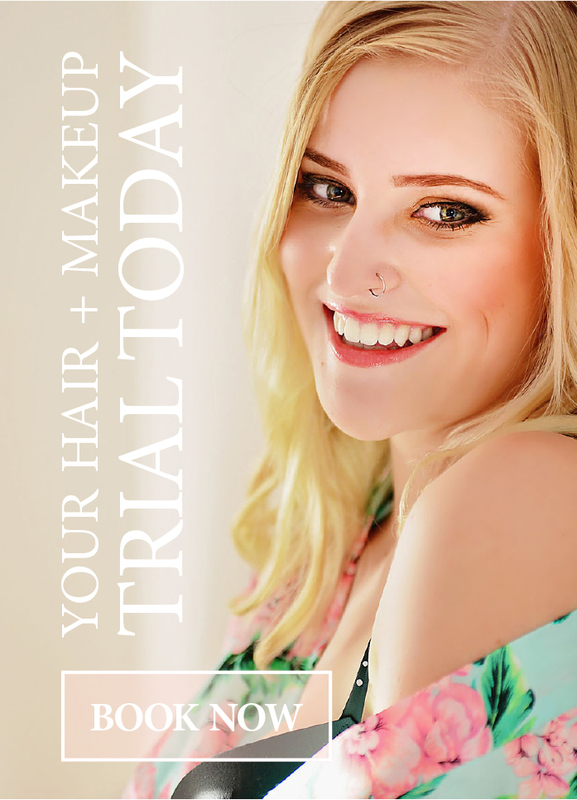 Attached are 2 small clips to secure to your hair ,for a seamless look. 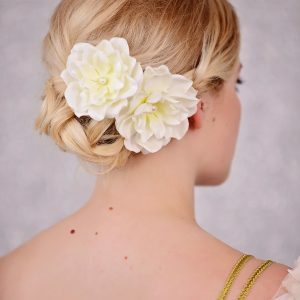 Our Ivory Silk Flower clips are delicate and feminine. Perfect for a beach, garden or destination Wedding. Wear the clips together or separately. 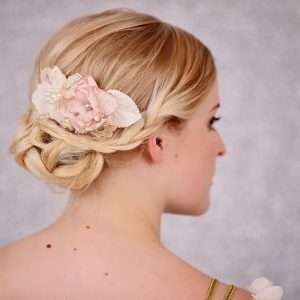 This Bridal Pink & Ivory Flower Hair Comb is delicately handmade with Pink ,Ivory and champagne coloured Flowers. The hair comb is embellished with lace and ivory pearls which adds a vintage look to this accessory. The comb is metal and is gold coloured. This Gorgeous Bridal Hair Comb is handmade with Ivory Chiffon and Lace. This Wedding Flower Hair comb is 14 cm long x 7 cm wide. 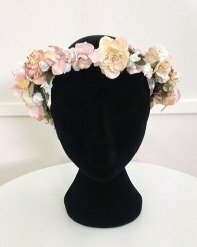 Flower Crown – Pink and Ivory. This Pretty Flower Crown is Handmade with Green leaves ,Velvet Flowers in Pink , Cream, Ivory and White. 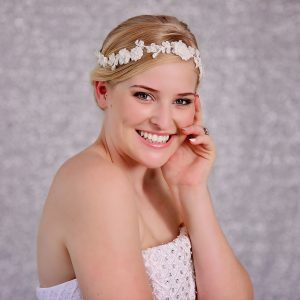 A perfect Hair Accessory for a Garden or outdoor wedding ! 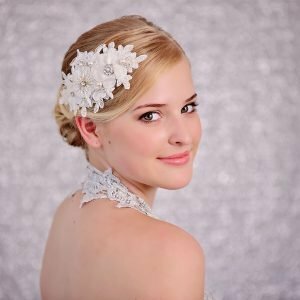 This bridal ivory flower hair comb is embellished with a sparkling rhinestone centre. The hand-beaded flower applique and ivory lace add some elegance to this wedding hair comb. 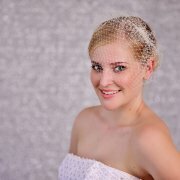 Wedding Veil with Pink Flower Crown is Perfect for an Outdoor Wedding ! This White Tulle Wedding Veil is attached onto a Pretty Pink Flower Hair Crown. The Crown is handmade with Wire Stem, Small Delicate Flowers, Fabric Flowers & Leaves. 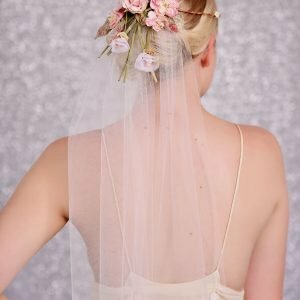 The Tulle Veil is attached with Velcro it can be removed from the Flower Headpiece. Something a little different for your Special Day ! 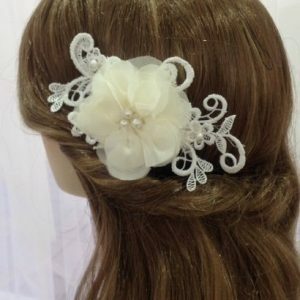 This Hair Comb is handmade with white lace, peach flowers and white/clear beads. The flowers are pale pink/peach in colour . The lace is attached on a metal comb ! 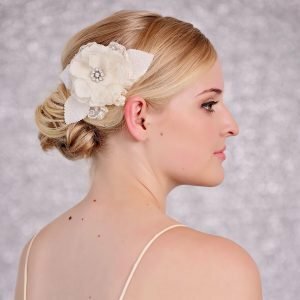 This delicate bridal hairpiece is handmade with white lace and small soft chiffon flowers. 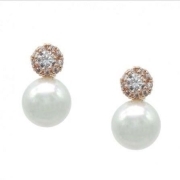 The hairpiece is embellished with white pearl beads. Attached is 2 small hair combs on each end of the hair piece.